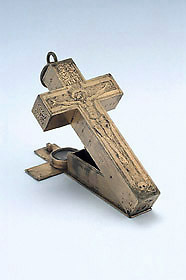 The cross has two components: a base plate with a raised box section, and an upper cross-shaped box hinged to the base. A catch operates when the cross is closed. The base plate has a small, glazed magnetic compass, and one side of the box section has a scale on two sides, marked 'GRADVS ELEVATIONIS POLI', 10 to 85 degrees, divided to 5 degrees from 10 to 60 and to 1 degree from 60 to 85. This is used to adjust the upper section to an angle appropriate to the latitude. The upper section carries the hour lines of a polar dial, where the shadows are cast by the six edges of the top part of the cross on to lines on six rectangular faces. The hour lines are arranged, proceeding counter-clockwise around these faces, 1 to 6, 9 to 12, 6 to 9, 3 to 6, 12 to 3 and 6 to 11. The four square faces carry decorative engraving, the two remaining rectangular ones the signature '[star]M[star]P[star]' and the date '1596'. The upper cross-shaped face has an engraving of Christ of the cross, surmounted by the inscription 'INRI', signifying 'Jesus of Nazareth the King of the Jews', and with a skull and cross-bones at the base. The lower face has an engraving of the brazen serpent on a pole with a top cross-piece. Parts of the box sections could have been used to house relics and one part has been made into a small compartment, possibly for this purpose, though the cover is missing. There is a ring and shackle at the top for wearing the dial around the neck.